2009 West Texas Stock Dog Association (WTSDA); Open Ranch Sheep "Dog of the Year;" 2009 Permian Basin Fair "Iron Dog;" 2009 National Cattle Dog Finals Qualifier; 2007 WTSDA Pro-Novice "Dog of the Year;" 2007 Permian Basin Reserve Iron Dog; 2007 Nursery National Cattle Dog Finals 5th Place; 2006 WTSDA Nursery Cattle "Dog of the Year;" 2006 National Cattle Dog Finals 6th Place. Buster is a grandson to Russell McCords' "Stetson", who was 3rd at Meeker , and the first BC to sell for over 10K and sire of "Rudy" (2003 Resv. national Cattledog champion). Buster's full sister, "Missy," (video below right) was Permian Basin "Iron Dog." Buster's maternal Grand dam is Joe Raines "Okie," who is in the pedigree of many top sport Foundation sires and dams, such as Sandhill Brita. 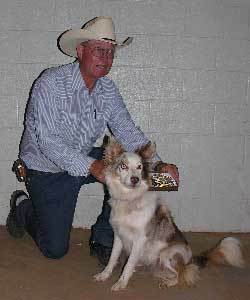 WTSDA Open Ranch Winner; 2011 Dog of the Year; 2010 Dog of the Year. Kallie is a very althletic, Forward and focused herding dog from Kim Hastings original line of working of border collies. 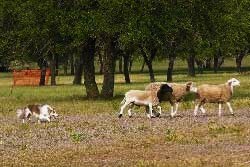 Kim is a well respected, well read and extremely knowledgeable breeder of fine ranch, farm and trial dogs.